CIA Precast & Steel has an in-house team of skilled and knowledgeable draftsmen with more than 30 years’ combined experience. They produce manufacturing and installation plans for precast concrete and structural steel projects. Our team will review the design intent and provide industry-specific feedback to achieve the most efficient and cost-effective way to deliver the project. We have often witnessed situations where collaboration between the precast concrete and steelwork sub-contractors has cost our clients time and money through poor on-site co-ordination. 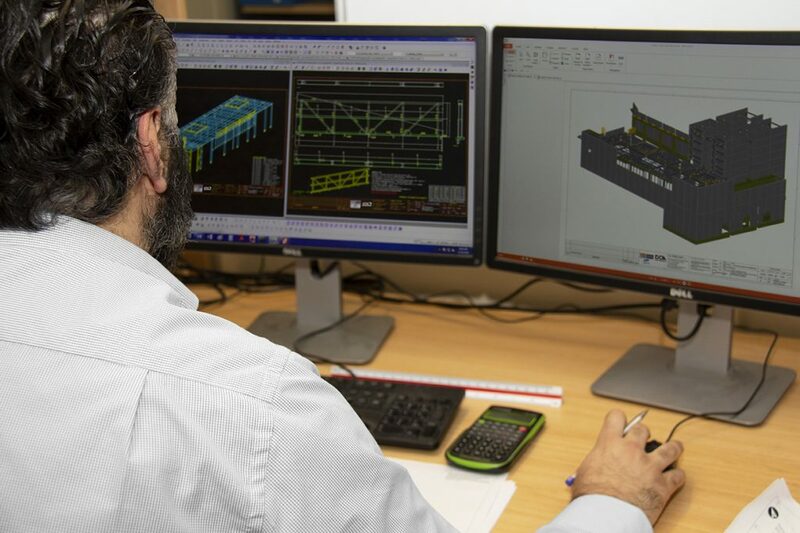 CIA Precast & Steel saves that time and reduces the impact of poor co-ordination by producing the precast concrete and structural steel together in the one 3D model. This allows us to flag any potential issues that may arise ahead of time and resolve them before delivery on-site. It cuts out the need for continuous liaison between sub-contractors. This in turn makes managing sub-contractors that little bit easier and gives peace of mind in the delivery of projects. CIA Precast uses 3D modelling software, which allows us to “see” the building come together before detailing the drawings. From this 3D model, and using clash-detection capabilities within the software, we are able to identify any discrepancies between the design intent and practical application.